Hello to our Friends and Families! 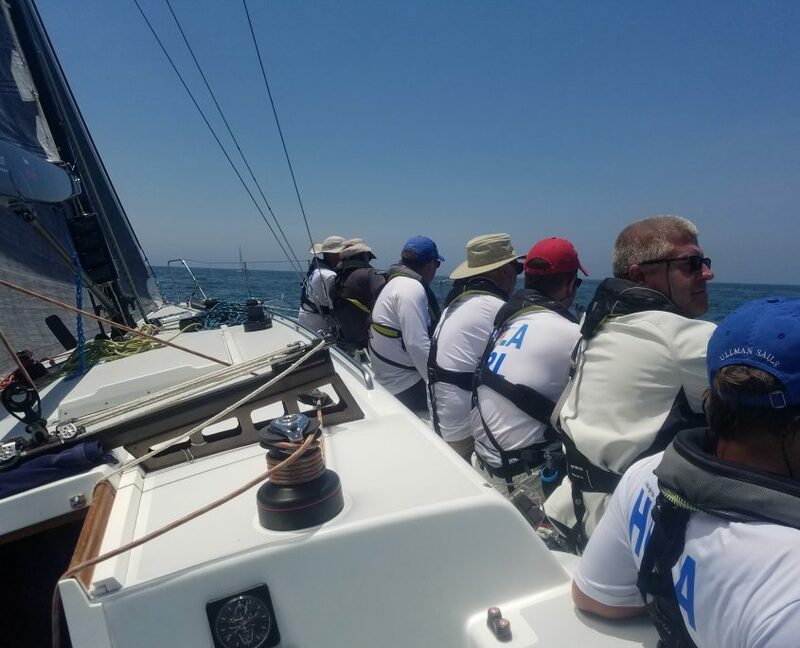 Ok, we are on the home-stretch of the 2017 Transpac. 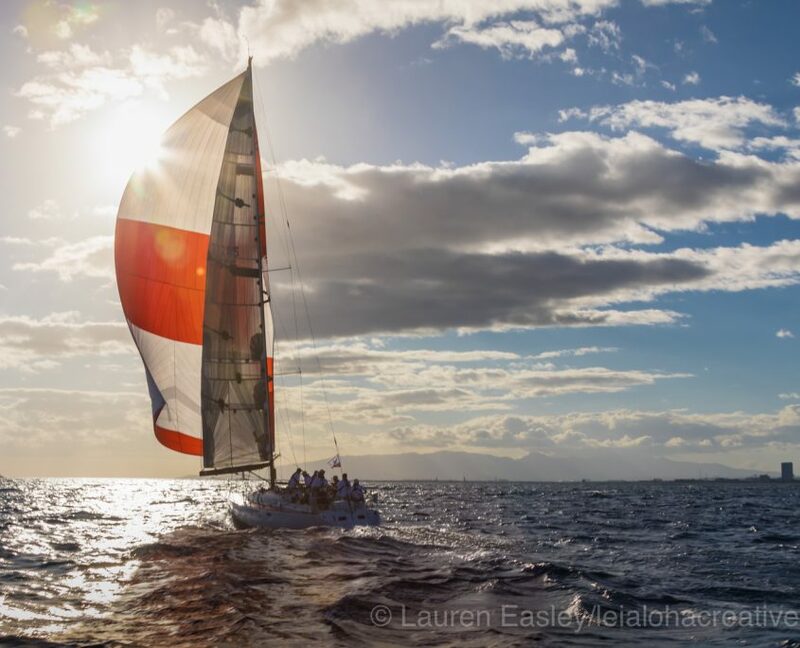 We are aiming straight at Molokai about 10 miles out, with Oahu just in sight. It feels good. And boy it’s been a tough couple days. Really shifty out here, with light breezes that require a lot of concentration to keep the boat moving… and moving in the right direction. We knew this was a fierce fleet from the outset. And it is panning out to be a hotly contested event. Horizon pulled out into a comfortable lead, but second thru fifth or sixth are completely up for grabs. We dropped to fifth in the position report a couple days ago, but reclaimed third yesterday and are hot on the heels of second place! 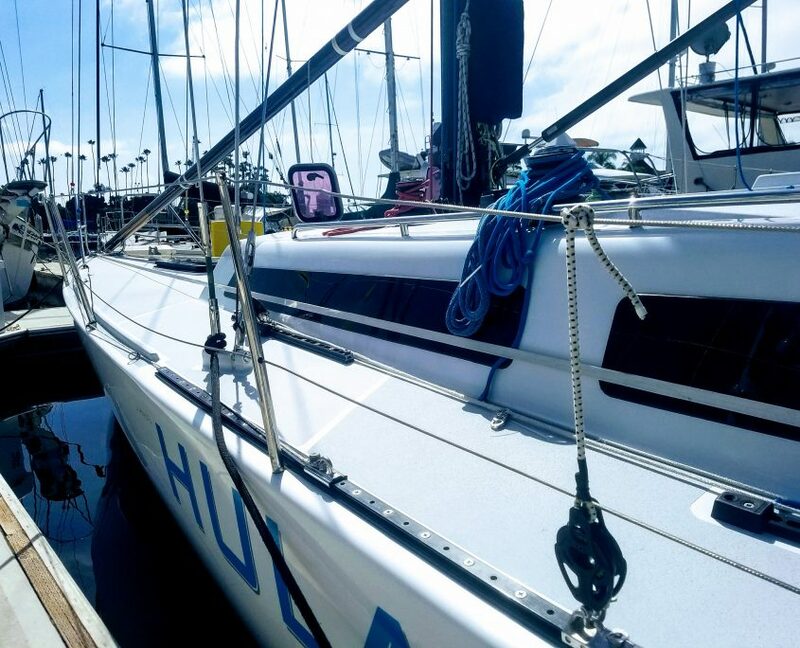 Apparently Sin Duda and Prevail were racing within sight of each other most of the day Thursday, and crossed paths less than 100 yards apart after 2000 miles of ocean racing! It’s more like a bouy race as the boats approach the finish. As I write this, Sin Duda, Previal, and Triumph are all in a tight pack just to the north of us (of course that was four hours ago since tracking information is delayed four hours for competitors), but it’s too close to call right now. This morning’s roll call has us in third still, but my calculations put us really really close to second. 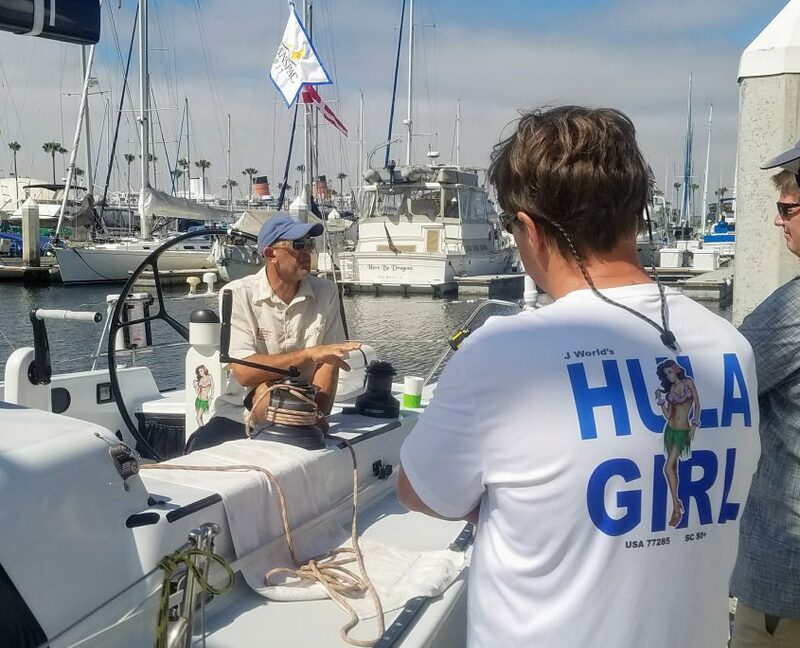 With the shifty conditions, our emotions oscillate with the rise and fall of our fortunes, but what has remained steady is the hard work everyone is putting in! We are definitely in the tropics now. We had lines of squalls pass by in the early morning hours the past couple of days, giving some wild wind shifts and dramatic starts to the days. Now it’s sunny, hot, and beautiful out. Breeze is finally up a bit, around 18 knots, and the seas are very flat, but a bit confused. The nights have been stunning. A starry sky that defies description, with a late night moonrise that looked like a freight train’s spotlight coming thru the clouds. 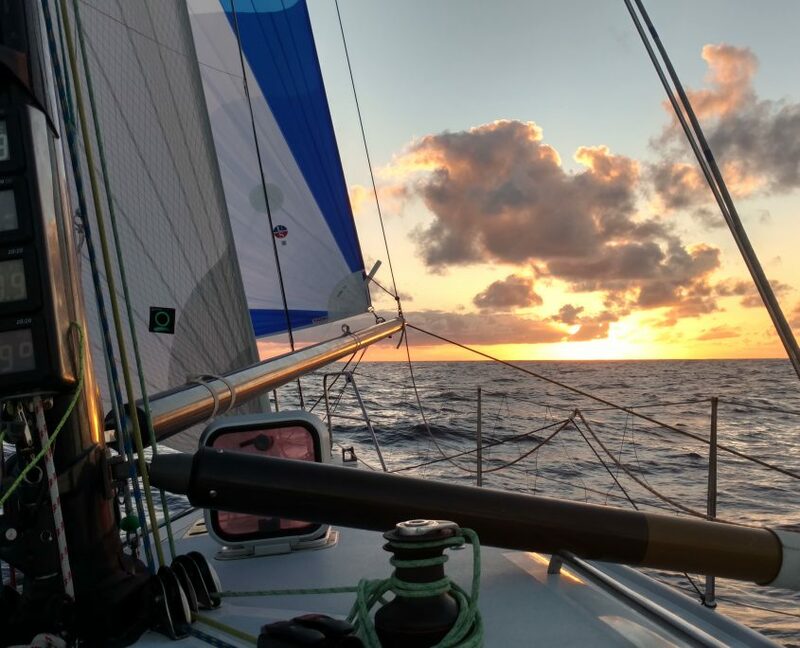 And while the days are getting hot, the nights are perfect shorts-and-t-shirts sailing conditions. Life onboard is great… it’s a really fun bunch of people and spirits are high. Everyone has showered… and a couple have even shaved. It was our last night at sea, so dinner was Cornish game hens with a port wine reduction, a potato galette, and roasted asparagus. This was paired with a 2017 Charles Shaw Chardonay. Desert was a Neapolitan gellato. Just kidding. We had freeze dried. So now, with the finish line more or less straight up ahead and Hula Girl in line for a happy-hour finish off Diamond Head, I want to thank all the folks who have helped pull this effort together. Coaches Patrick and Paul have been absolute rockstars. Thanks to Rick Shema for his world class weather routing info. Thanks to my parents for being shore support in Long Beach (and everywhere else). And thanks to my wonderful wife for all the support and letting me disappear every summer for weeks on end! And finally, of course a big thank you to the whole team for making this a special experience. 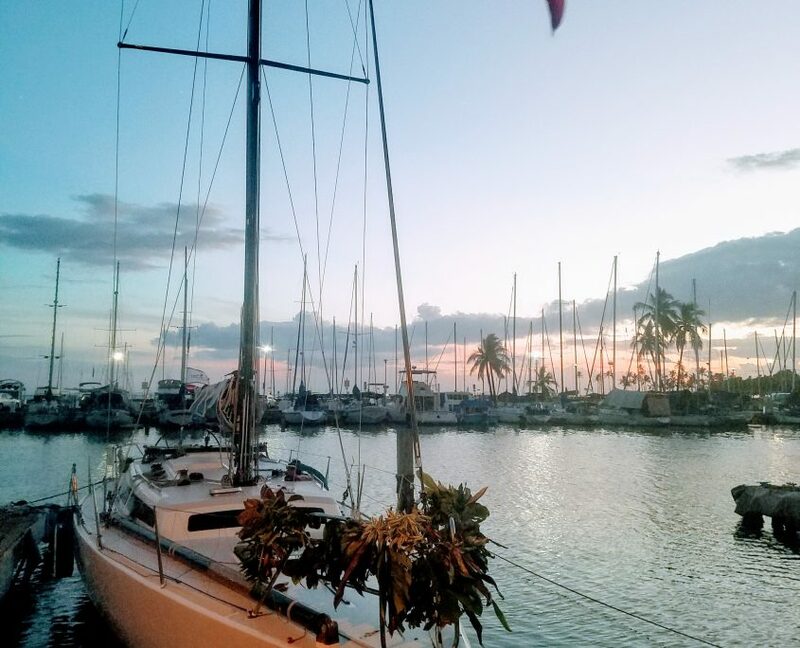 When we start these things, we are essentially a bunch of strangers, albeit strangers with similar mindsets and one great aspiration: to race to Hawaii. For some aboard, it is the first time. For others, they are doing it again (take it from me, it can be addicting). But as the trip progresses, we see that the strangers become collaborators, shipmates, and friends. 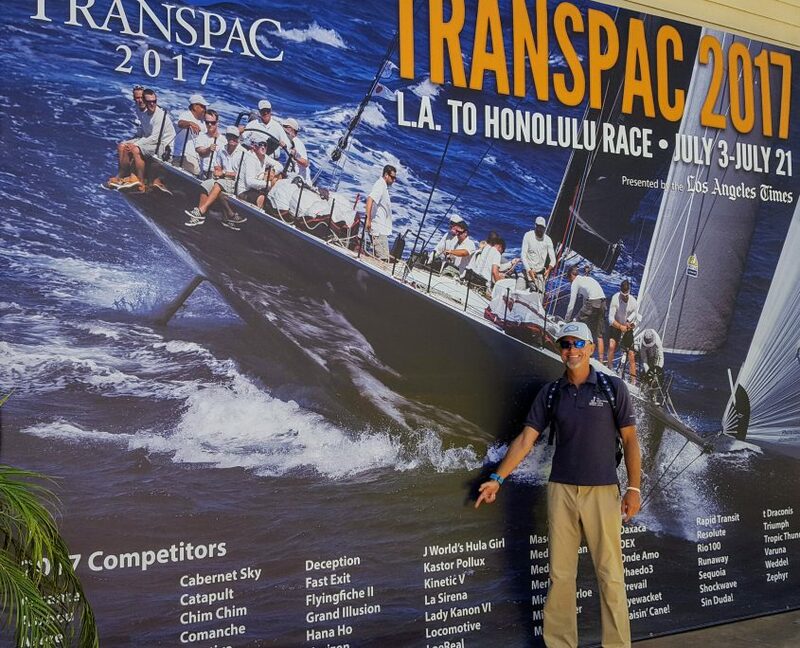 For us coaches, it is truly a gratifying experience to both bear witness to individuals realizing the dream of the Transpac and to see a disparate group work together towards a common goal, and in so doing become something quite different: a true racing team. 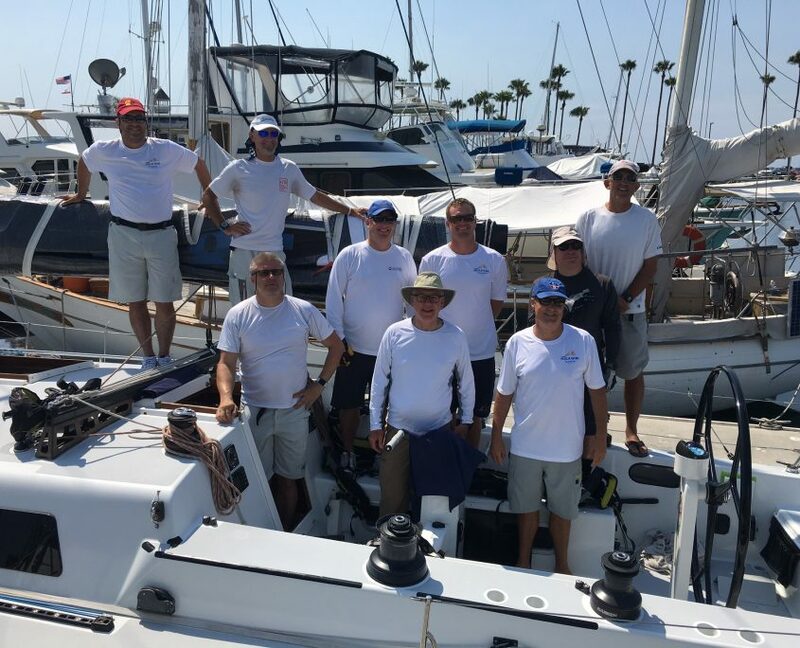 So to the crew this year, awesome job cranking out a fantastic showing in one of the toughest fleets in one of the world’s premier yacht races. Seriously impressive. And beyond the excellent performance, I had an absolutely fantastic time sailing with all of you. Hello all from literally the middle of the Pacific! 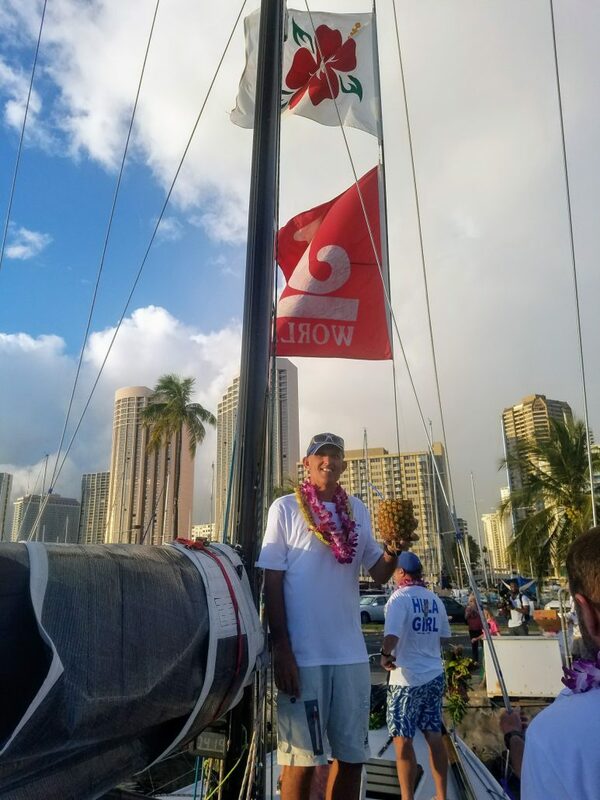 Here’s the 2017 Transpac update #2 from J World’s Hula Girl. So earlier this evening, we passed the 1000 mile marker, and in the morning we will scoot thru the halfway point. So right now we are farther from any speck of dry land than you can get anywhere else on the planet. We figure that the closet people to us right now (excluding the other racers) are on the International Space Station some 270 miles above us! Pretty cool. 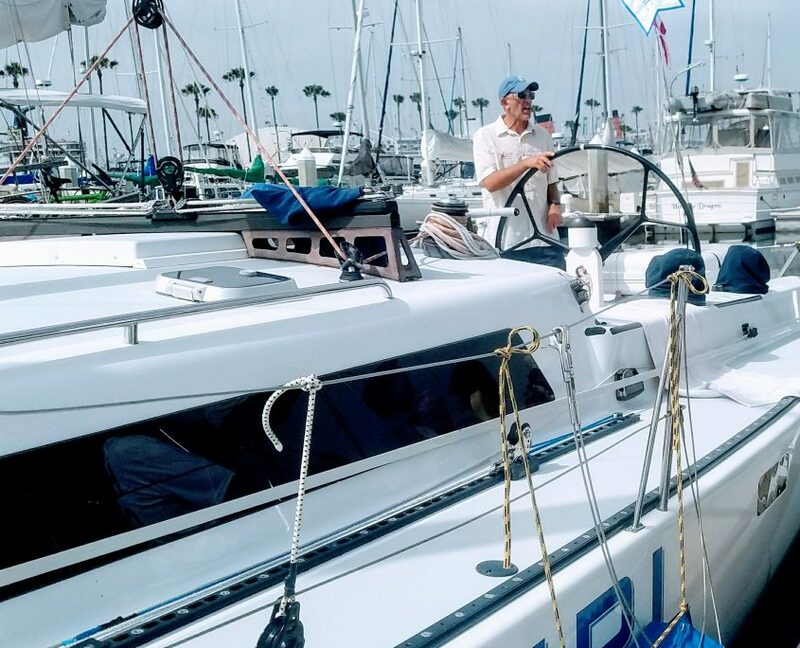 Ok, so after a day with the A3 spinnaker up, the breeze started shifting to the North as we worked under the E Pacific High, and we peeled to the big A2 spinnaker. The morning position report on Day 2 had us in 6th place. By Day 3 we had climbed to fourth. We hung there, but late last night our luck took a turn. We caught a big piece of fishing net on the keel and were off the pace for a good while. We dropped the spinnaker in the morning, stopped the boat and backed down. We got it off and headed back on our way, but it the whole affair set us back relative to the competition. We know we lost some miles, but hopefully we haven’t fallen in the standings. We won’t know until they post them tomorrow morning, so we’ll work hard all night long to redeem ourselves. With the race only half over, and some more variable weather on the way, we have a pretty good shot at picking off some of these boats in front of us. Chim-Chim, the beautiful Gunboat 62 passed us not far off last night, then the new Pac 52 Bad Pak went screaming by today. We heard that Rio 100 broke her port rudder when she hit a submerged object at speed… ouch. 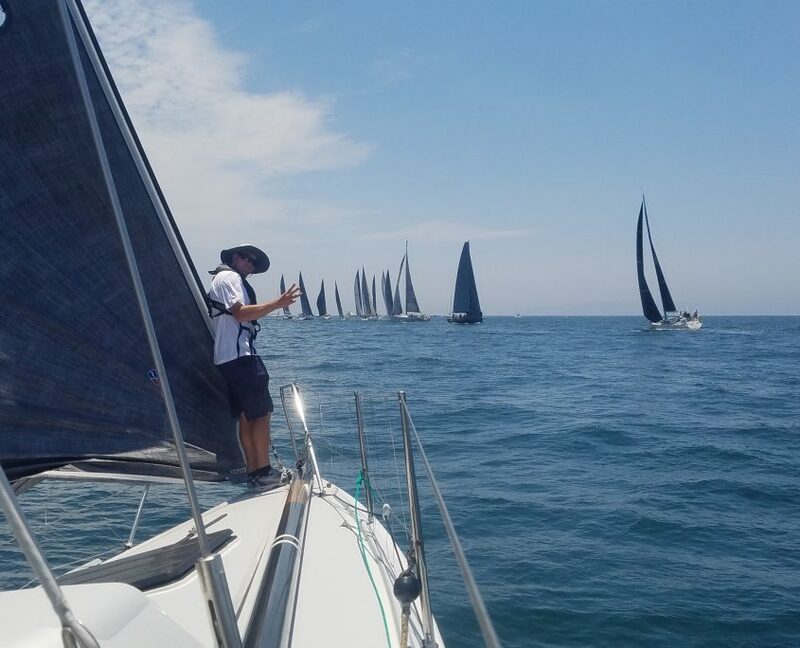 It’s fun watching the three super trimarans Phaedo, Maserati, and Mightly Merloe duke it out for the line honors…. 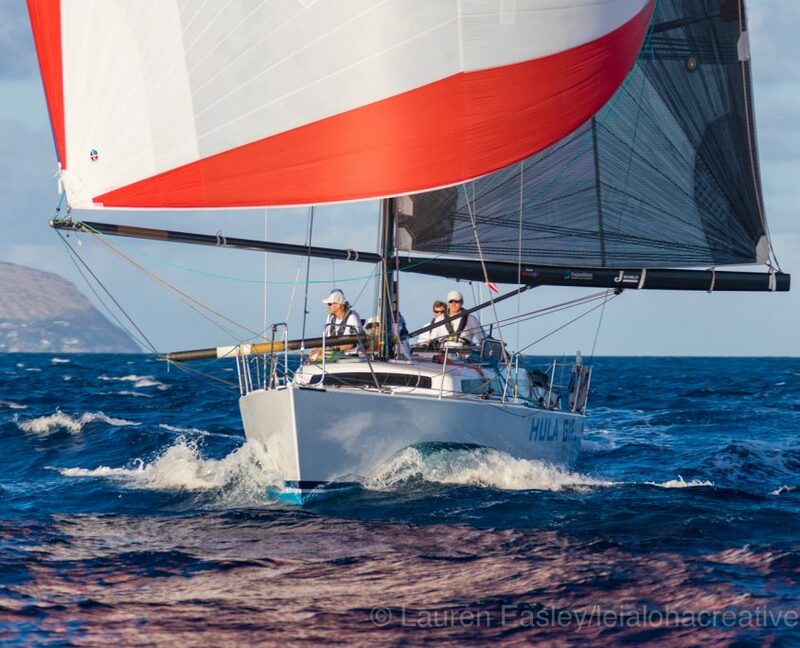 and Comanche is tearing it up trying to set a new course record. Life onboard is good. It was a bit overcast today, but with the breeze behind us and the boat leveled off things dried out pretty nicely. Everyone is doing really well, and we’ve been impressed by the overall ability level of our crew. Plus it’s a fun bunch! 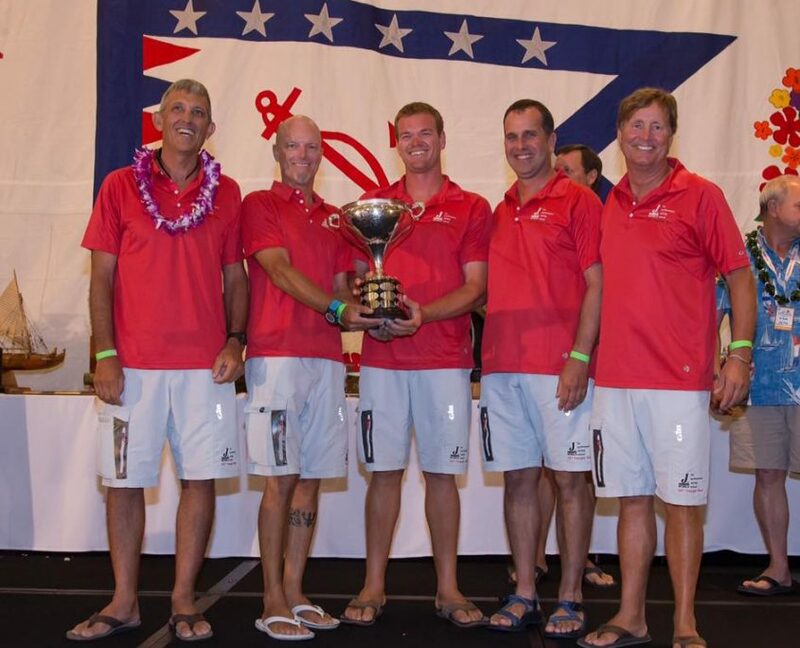 It’s fun to have some team members aboard who we have sailed with in the past, and fun to get to know new folks. And you get to know people pretty well out here. They say you never *really* know someone until you have gone to sea with them! That’s it for now. We’ve got a sweet 20 knots of breeze with really flat seas and are slipping thru the waves at a steady 12-13 knots pointed pretty much straight at Hawaii. So life is good out here in our little patch of water on this big blue marble. G’night to all our landbound friends… wishing you all sweet dreams of sailing machines, or something like that. We’ll see you in the morning. It’s time to get all our family and friends caught up on the happenings out here in the deep blue Pacific. 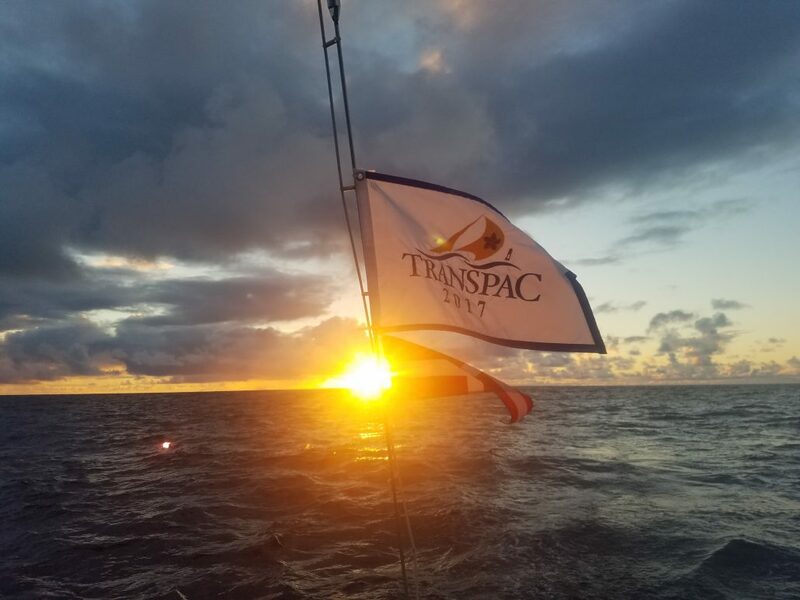 We are now about two and a half days into the 2017 Transpac and things have started to settle down enough that yours truly can take a minute to run thru the past couple of days. 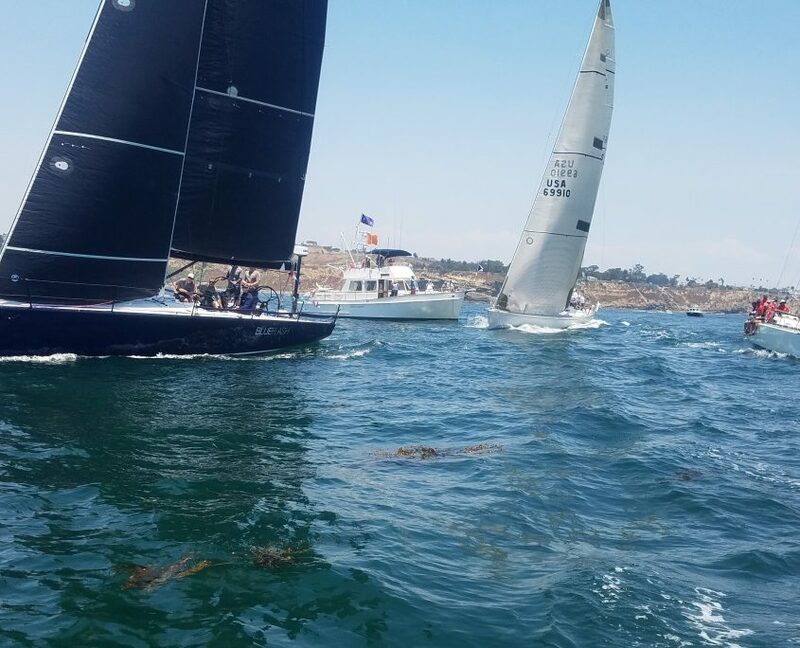 On July 5 our fleet started off of Point Fermin in LA under clear skies. We had a nice start on the boat end of the line, mostly clear of traffic, and we started across the channel towards Catalina Island. The breeze built on the way, and by the time we passed the West End, we had shifted from the big genoa to our #3 jib. We were seeing a nice 15 knots of breeze and a really mild sea state. 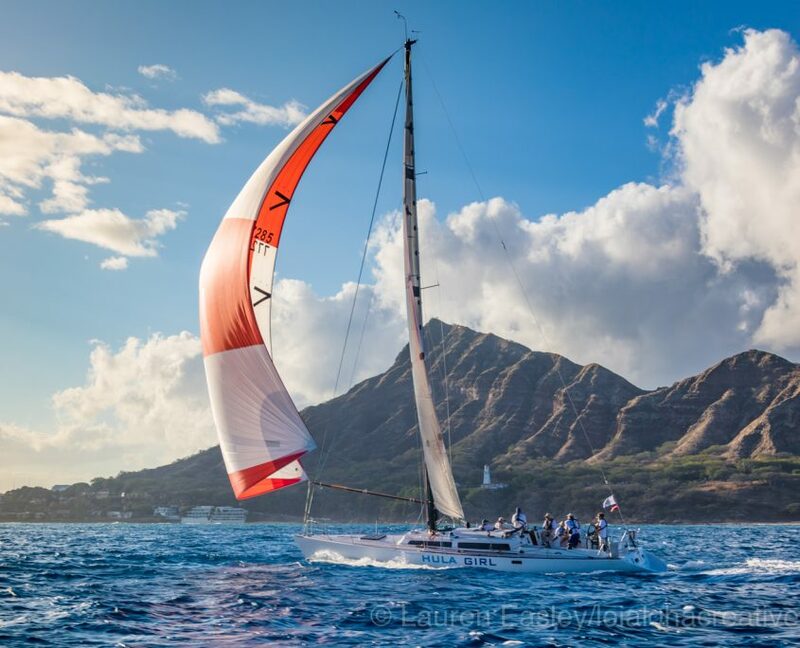 The crew began to adjust to life at a good angle of heel, while getting a feel for the way Hula Girl sails. The first night was stunning. A large moon in a cloudless sky lit up the surface of the water, making it look like a sea filled with scampering silver fish. Hila Girl clipped along nicely, and we started to grow used to the sound of the water sheeting off the hull. Our fleet is going to be very tough, very tight. 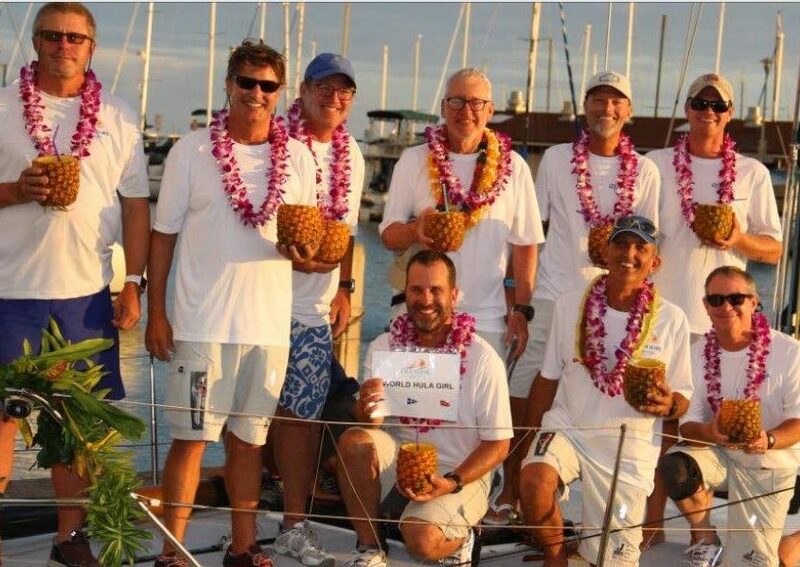 The ten boats in our class are all very close in design and speed… and the talent out here is astounding! To do well, we are going to have to continually work hard, sail to a high standard, and keep the boat in good wind and at a good heading. This year we were faced with an atypical split high pressure system, with the eastern portion sitting pretty much right on top of our racecourse. That means light winds along the direct rhumb line course. And that’s not good. 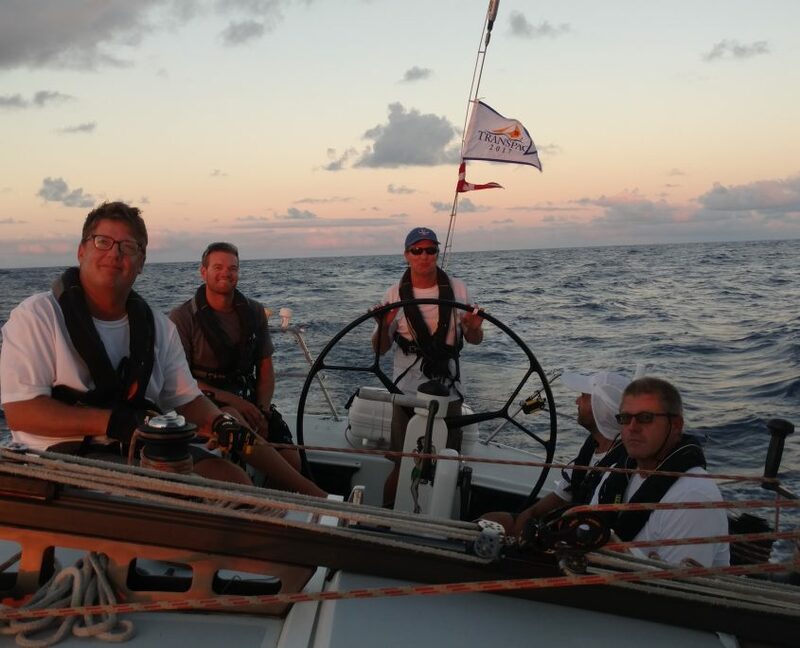 So our whole fleet opted to dive south early to stay in good breeze, and it’s been working great. The downside is that we end up sailing more distance. So it’s a fine line, and some boats are staying a bit north, and other working farther south, We feel pretty good about where we are. We also had some great pre-race coaching/guidance from Rick Shema (weatherguy.com) and wanted to thank him for his great routing advice. Now let’s see what we can do with it! 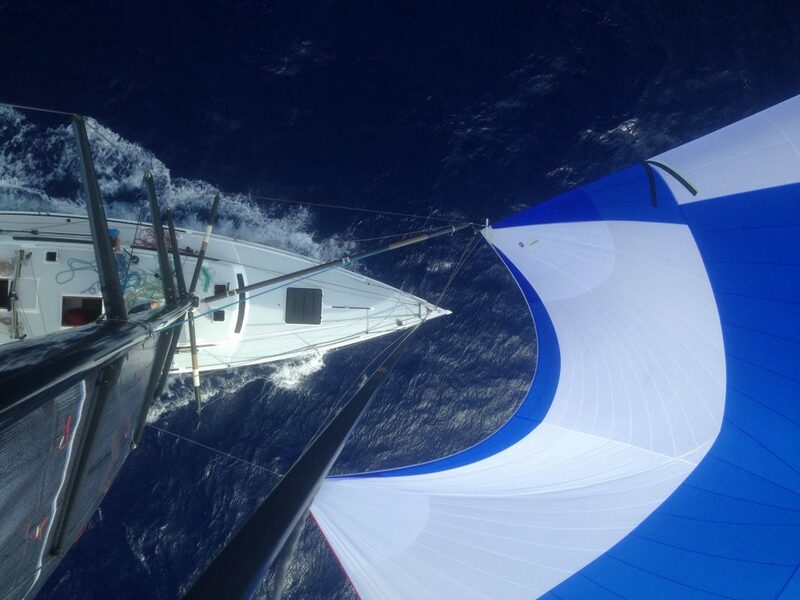 After a day of pretty tight reaching with the #3, we shifted to the Jib Top, and even took in a reef for a while. By midday today (Fri) we thought we could get the first spin up, so out came the A3 and away we went. SInce then, we have been reaching with that sail, slowly getting lifted as we get farther West. Position reports have our fleet really tight…. there is a pack of six boats just to the north, and three more just to the south. Some 25% into this race and it really is absolutely anybody’s to win. We are into a bit of a drag race now, but looking down the road it could get a bit interesting weather wise. Life onboard is good. With the wind getting farther behind us, the boat has been leveling off. Things are starting to dry off a bit (it gets a little wet the first couple of days) and with any luck the soakings associated with upwind sail changes are a thing of the past! Tonight for dinner we had some wonderful braised prime rib medallions with a peppercorn sauce paired with a delightful Cabernet, Just kidding. We had freeze dried lasagne. Ok, I think that’s it for now. It’s just past midnight out here, some 600 miles off the coast of North America. Paul just went up on deck. Derek and Patrick are hitting the rack for some well earned sleep. It’s beautiful tonight, a slightly bigger moon, really flat seas, and a nice steady breeze. We are starting to get into Hula Girl’s element, the downwind slide. So now we need to see if we can put some miles on these other boats! Good night everyone.. and we’ll be in touch again soon…. After much preparation and anticipation, the J/World Hula Girl team is underway and racing. Watch this space for updates and reports along the way. http://sailing-jworld.com/wp-content/uploads/2017/07/20170705_130324.jpg 3024 4032 jworld http://sailing-jworld.com/jworldwp/wp-content/uploads/2015/01/Header-Logo.gif jworld2017-07-05 21:54:002017-07-05 21:54:00TRANSPAC 2017 - HULA GIRL IS UNDERWAY!